and from 8:30 AM to 12:30 PM and from 2:00 PM to 8:00 PM in July and August. We provide a snack bar/bar, bread for sale in July/August, laundry facilities, and an activity room withfoosball table and TV. At the end of your stay, we can clean your mobile home upon request. We offer charcoal barbecues for rent as well as refrigerators for the sites tent locations. To stay connected with your family and friends, you can connect for free to the wifi network at the reception desk, bar or entertainment room. The camping located in South Finistère has everything to seduce you! For mobile homes not equipped with a TV, you can rent one. €5 per day or €35 per week. You can rent linens: €10 for flat and fitted sheet (big or small bed) and towels (1 large towel + 1 small towel et 1 washcloth) €5 per kit. Full service cleaning is available at the end of your trip: 1-bedroom mobile home €40, 2-bedroom €70 , 3-bedroom €90 , 4-bedroom €100. For your barbecues, charcoal grills are authorized. Grill available for rent €3 per day or €15 per week. Reservation recommended. If you want to camp, you can rent a refrigerator: €40 for the week or €70 for two weeks. Reservation recommended. Free from April to September near the front desk. Starting in May, a small convenience store is available with basic products and cold drinks. In the sanitary black laundry facilities are available. Across from the front desk, there is the activity room with foosball table and TV. Groups can rent out the activity room so that they can all eat together. You can also rent sheets, bath towels, baby gear (baby bed, high chair). We provide a baby area with a changing table and a shower accessible to people with limited mobility as well as laundry facilities with a washing machine and dryer. The machines work with tokens that you can buy at the front desk during opening hours: washing token €5, drying token €3.60. For babies, we have cribs, high chairs and baby baths available for rent at €14 per week or €2 per day each. Reservation recommended. You enter the campsite with a badge that you receive upon arrival. You can drive to your pitch from 7:00 AM to 11:30 PM. Outside these hours, free parking is available at the entrance to the campsite. 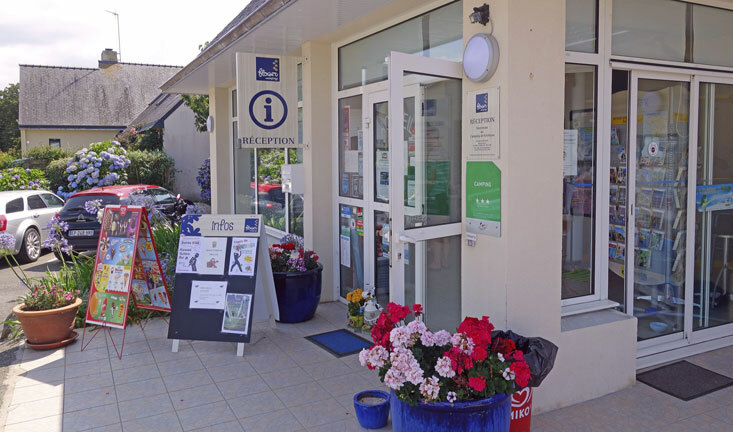 For your stay at the Kerleyou Campsite in DOUARNENEZ, whether you are renting a mobile home or camping in your tent or camper at a pitch, you have access to all of the campsite’s services.